A lot can be learned about a place by glancing at the local newspaper. Take Temescal in 1873, for instance. The area was buzzing with activity—the bridge over Temescal Creek had recently been completed, there were at least a half-dozen saloons in the area, and the Berkeley Railway which transported people between the nearby cities of Oakland and Berkeley was running every 15 minutes. But it was also a town experiencing growing pains—Telegraph Avenue was a mess of mud, and the schoolhouse needed a lot of work, especially in fixing a leaky roof. Humboldt Park Hotel with its fine garden, attracts many visitors, especially on Sundays. The French restaurant here supplies as fine a meal as can be obtained in the city over the Bay. There are further in full blast now three grocery stores and two butcher shops. The latter are patronized by country men for miles beyond this precinct. Although the drinking saloons number six, a drunkard is rarely seen on the street, and now are almost unknown. There is a snug school house for the 400 inhabitants constituting the population of the village and country immediately adjacent thereto. Here is the town terminus of the Berkeley Railway, over which cars run every fifteen minutes during the day. Mr. Lusk is the proprietor of a pickle factory and fruit-canning establishment not far from the railroad. He employs both white and Chinese workmen. Many prominent citizens have fine residences here, among them we may mention the names of Messrs. Zach. Montgomery, Alden and many others. There are three blacksmith shops in the place, one of whom is employed by the Railroad Company. Babcock’s wagon and carriage factory turns out nice jobs. Temescal is part of a huge tract of land called El Rancho de San Antonio, deeded to Don Luis Maria Peralta by the governor of California in recognition of Peralta’s military service. 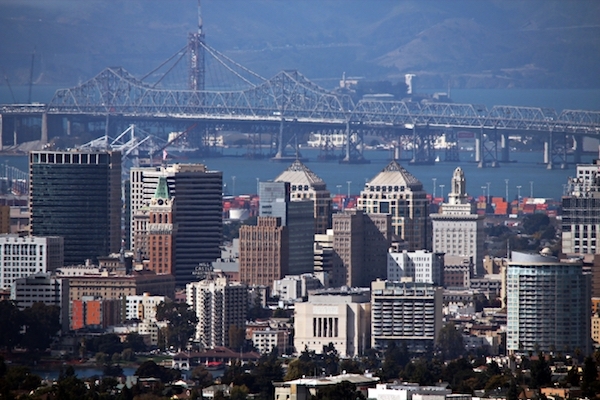 The grant is split among Peralta’s four sons, and “Encinal de Temescal,” an area that includes Emeryville, Piedmont and North and Central Oakland, is deeded to his son, Vicente. Temescal Creek is dammed by hydraulic mining pioneer Anthony Chabot to create more fresh water for the growing population of Oakland, which creates Lake Temescal. Josiah Lusk opens Lusk Cannery on what is now 40th Street, in between Telegraph and San Pablo Avenue. By 1874, the cannery is packing 7,000 cans of preserved fruit per day, and 150 people work at the factory. The factory moves up the road to Claremont Avenue in 1877. The cannery employs between 600-800 people throughout the 1880s. First horse car line is constructed and runs down Telegraph Avenue. Horsecar line is extended from 40th Street to Temescal Creek, the present site of 51st and Telegraph. The daily trip from Seventh Street in downtown Oakland to Temescal takes about an hour. Vicente Peralta dies at his Temescal home at age 59. Steam dummy railroad line established between Temescal and UC Berkeley, and is the only transportation between Oakland and Berkeley for the next 16 years. Annexation of Temescal is approved by the city of Oakland, but is rejected by the people of Temescal. Lusk Cannery closes and is demolished. The electric car line brings an end to the steam train line. Temescal is officially incorporated into the city of Oakland. 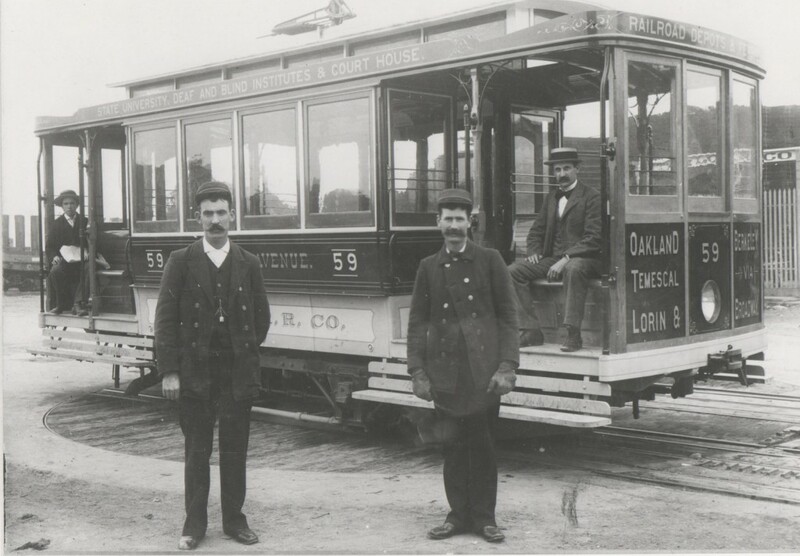 Car number 59 was one of the earliest electrified streetcars to see service on Telegraph Avenue. Photo circa 1895, courtesy of Ray Raineri. What an amazing find these articles are. So descriptive of a bygone era… love the bit about hobgoblins and free showers! Temescal “our northern suburb” – oh my that is adorable. I love reading about Temescal had its own identity so far back, and that it was considered distinct from Oakland. Does anyone where the Humboldt Park Hotel was, or that fine French restaurant, or that Temescal Schoolhouse?